August Hotel, a local band, performs during Block 6 of Dance Marathon. Ryan Lammers, a Communication senior, is a member of the band. As dancers embarked on the second half of Dance Marathon on Saturday morning, a campaign to raise $30,000 in 10 hours during the event approached its own midway point. With more than six hours to go, fundraising efforts ongoing during the marathon — such as a phone-a-thon and social media outreach — had raised $14,703, the finance committee announced to a cheering crowd. This is the second year the committee has set a specific goal for fundraising during the marathon. The finance committee also offered a grant program to dancers through Student Enrichment Services for the first time this year, which Nate Korn, finance co-chair, said was the most noteworthy change from previous marathons. “What that was was money we raised through faculty, alumni and sponsorships pooled together to provide matching grants to dancers who could be struggling with fundraising,” the Weinberg senior said. Back in the tent, dancers grooved to a live performance by August Hotel, a local band whose guitarist, Ryan Lammers, is a Communication senior. 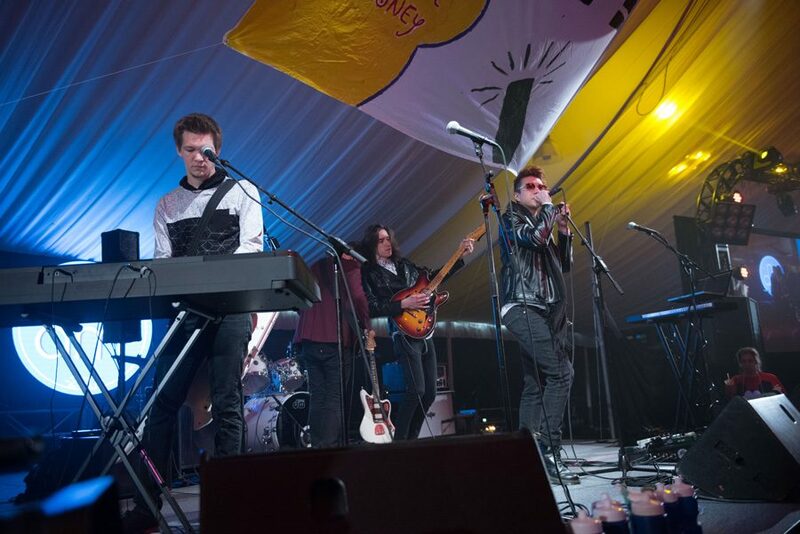 The band played original music, including their new single “12AM,” and covered songs such as Two Door Cinema Club’s “What You Know” and The Killers’ “Mr. Brightside,” a Northwestern party staple. Reid Walters, a SESP freshman, said she was impressed with the band’s performance and welcomed the calmer concert-like atmosphere after 16 hours of dancing. The block closed with a speech from Melissa Ciraulo, whose son receives speech therapy at Gigi’s Playhouse.